Here's a sneak peak at the new book project I've been working on. I'm excited to say its almost ready for publication, but still needs a couple finishing touches. I am hoping to have it available to the public by the 1st of November (maybe sooner!) In the meantime, you are probably wondering what this book is about. The new book is geared towards the younger crowd - children in the 3-8 developmental age range, but older children may enjoy it also. 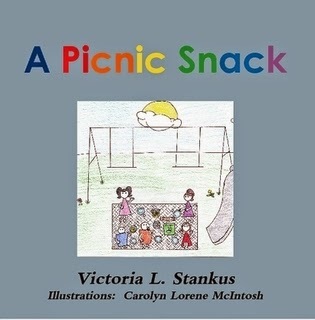 It is called, "A Picnic Snack," and is based on a fun experience I had when I was a little girl living in the small town of Manito, IL. My neighborhood friends and I often played outside together, and I can remember more than one occasion when we all brought snacks from home to share with everyone else. The two main ideas of the book are "sharing with friends" and "thanking God for our food." My niece, Carolyn, drew the illustrations, and she did a great job for her debut in the publishing world. I enjoyed working with her on this. I am using the same company I used for my first book, and will be sure to let you know when it is available to the public.